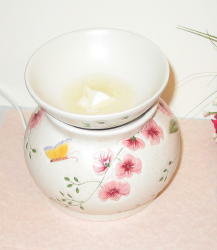 A budget high quality Aromatherapy candle product is now available! Finally, We have made our own aromatherapy candle. We hand pour every candle to ensure each soy candle is poured with love. A price saving, aromatic candle blended from the finest pure essential oils and made with a vegetable base as the wax. Each candle comes beautifully packaged in a 4 oz and 8 oz tin with natural cotton paper wick free from all metals And we use tin instead of jar to minimize the shipping cost. The candle is shipped in a white gift box that is made from 100% Recycled paper content. This is definitely the lowest price you can get for aromatherapy soy candle. Please choose from over 8 scents. Currently, we will only ship to USA. But we will soon upgrade it to be available for international order. For order more than 6 of 4 oz. candle or more than 3 of 8 oz. candle, the shipping fee will be $10.35 (Medium box). It can fit about 15 candle of 8 oz. or around 30 candle of 4 oz. Quantity more than that? then I will consider bulk order. Contact me for the price. I think I still have problems with my setup here with paypal. so if you have placed order and paid, please contact me again using this Contact form to make sure I got notice about your order. Sorry for this inconvenience cause. 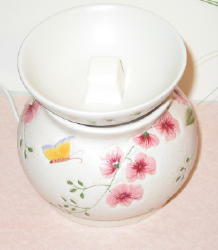 Looking for more aromatherapy candle product? 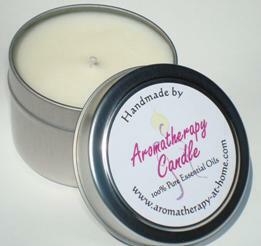 Aromatherapy soy candles are naturally made from 100% biodegradable, safe and non-toxic materials. There is no paraffin, synthetic fragrances or petroleum products in these candles. Each 3x3 single scented pillar candle is made with a natural lead-free wick and can burn for up to 40 hours. Its the perfect alternative for those living a natural lifestyle. Choose from 4 scents: Cedarwood, Lavender, Patchouli and Rosemary. For an aromatic experience without any paraffin, synthetic fragrance or petroleum products, aromatherapy soy candles are just the thing for you. They now come in an economical, convenient and festive container. Each candle comes beautifully packaged in a 4oz tin with a natural lead-free wick and can burn up to 25 hours. 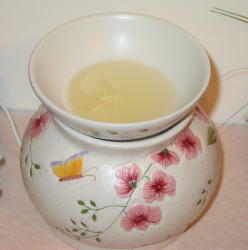 Sweet Dreams - Scented with essential oils of Lavender, Lemongrass, and Marjoram. Escentual Love - Scented with essential oils of Rosewood, Patchouli, and Lavender. Northern Forest - Scented with essential oils of Spruce, Cedarwood, and Fir Needle. Cozy Home - Scented with essential oils of Cinnamon, Clove and Nutmeg. 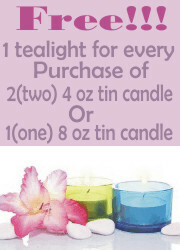 Aromatherapy soy candles are now available in the tea light variety. Being 100% vegetable based, this is the perfect alternative for those who live a natural lifestyle. Each tea light are unscented, has a lead-free wick and is housed in a plastic cup, with each candle having a burn time of up to 4 hours. 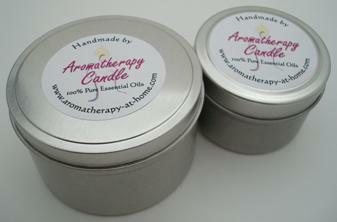 Aromatherapy soy candles now also come as scented mini tarts that will diffuse a scent for several hours. The tarts are made with 100% natural essential oils, soy wax and a small amount of beeswax. Each 3 fl. oz container contains six ½ fl. oz mini tarts. Place 1/2 oz mini tart in oil burner and let it melt. You can add a second one to the bowl. 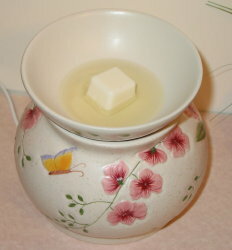 After the soy wax melted, it will begin to fill the room with the scent. I left the oil/tart warmer on for about one more hour. The scent continued to diffuse throughout the room until after the wax had rehardened.